In order to draw sympathy from the audience, Talk to You uses several techniques. Kim Je-dong, the host of Talk to You, often descends from the stage to directly communicate with the audience. Also, the audience expresses their opinions by using a sketchbook. 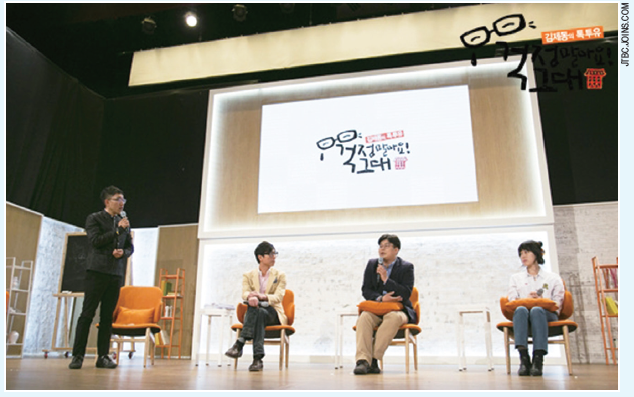 After listening to their opinions, panelists who are from the fields including sociology(Choe Jin-gi), neurology(Jeong Jae-seung), and entertainment(singer YOZOH) give advice to the participants. By using this style of communication, the program could gain more interest and sympathy. Unlike typical talk shows that involve celebrities, Talk to You is conducted without scripts so that a host of the show could solely concentrate on opinions of the audience. This type of candid talk show offers a refreshing new atmosphere to viewers. This format is possible because of the talented host, Kim Je-dong. He can provide immediate feedback after listening to comments from the audience, and he is able to successfully incorporate the audiences’ reactions in the show. His moderating style is what really makes this new kind of talk show workable, and overall, more entertaining JTBC.JOINS.COM and satisfying for the audience. It may not be easy to elicit the true concerns of an audience in a talk show situation. This is because people are likely to feel ashamed or embarrassed to openly discuss what they really think. In fact, Lee Jee-hyun, a member of the audience who appeared on the second broadcast, said, “I do not want to share my honest feelings with others in public. I feel ashamed.” Every audience member of Talk to You is provided with a sketchbook, the so-called “Let us talk together through Kim Je-dong’s sketchbook.” Through these simple sketchbooks, Kim reads the concerns of the audience members who prefer to write their thoughts down rather than verbalize them. The sketchbook enables Kim to learn about what his audience is really thinking. As a result, he thoughtfully considers the comments and then talks about his own real life experiences to demonstrate his understanding and sympathy for the audience. “I hate my uncle who compares me to my cousin on special holidays. It is quite embarrassing to hear some of the questions he asks about employment and grades,” commented one of the audience of the show. Kim advised the writer not to think too much about it and instead, just say, “I do not know” when his uncle asks him annoying questions. The sketchbook used in Talk to You is not just paper used to write down concerns, but a tool for the audience to use to feel more at ease. In the last portion of the program, the so-called “New ‘York’ Times,” the audience has a chance to speak openly about particular negative events or people that were a source of recent annoyance. They frankly express their feelings of frustration or anger. In one episode, an audience member said, “I am not a superman but society requires me to do so much work. I have to do school work, take licensing examinations and find a job. It is impossible to completely do all the work given to me, and I can’t just say ʻMind your own business’ when someone asks me a bothersome question.” This activity allows the audience to relax a little by venting their frustrations in this cathartic manner. Different experts in the program try to present their objective opinions with different perspectives, and this allows the audience to better identify with them. “According to a study in neurology, people can get angry when they cannot control a desire that they do want to control. 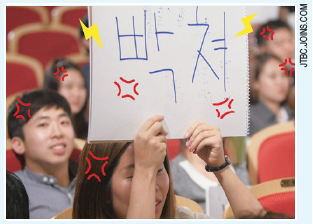 According to another study in social science, people get angry when they are compared with others,” said a sociologist Cheo Jin-gi. He added, “If the inequality index increases by ten percent, that means the school violence ratio increases by four percent.” The panel tries to interpret the concerns they hear and suggest alternatives by presenting reliable statistics and describing research related to those concerns. By using various experts in different fields, the program tries to present the audience with objective and useful information in order to resolve the problems mentioned.